The other day a friend took me salmon fishing for the very first time. I know, I live on the west coast and I should have been before now. To be honest, I have had many offers to go over the years, I just didn’t like the idea of sitting out there bored not catching anything (little did I know how fun it would be). Anyways, I took him up on the offer. Seriously, who can turn down some fresh salmon. I know I love seafood and the opportunity to catch several fish (and maybe set out some crab traps) sounded very appealing. We got up early and headed out to sea first thing in the morning. I didn’t know what to expect, but there is something that I quickly learned about myself as we started our day fishing. One thing I learned quickly about myself while out fishing is that I was not happy just to let someone else do the fishing for me. I was not happy to just “be there”. I wanted to learn exactly what sort of lures to use, how to use “down riggers”, what sort of bait to use to catch what type of salmon and why, what areas the fish tend to be, why fish get spooked and where they go when they are spooked. Basically I wanted to know everything about fishing that I could. Because deep down inside I wanted to learn how to become self sufficient. I wanted to learn how to catch my own fish, so in essence if I needed to, I could feed myself for a lifetime (not just a day). What would be the point of going out fishing with someone with 20 years of experience and NOT leveraging them as a wealth of information and model myself after in respect to fishing. It would be careless of me. I not only learned how to fish, I learned how to “catch” fish. The Catch. I Now Feed Myself for MONTHS. So, I guess you are wondering, did I end up catching anything. A big FAT emphatic yes. We caught a 26lb and a 11lb pound spring salmon, five 4-5lb pink salmon, and an 8lb coho salmon. After the day was over, the learning didn’t stop. 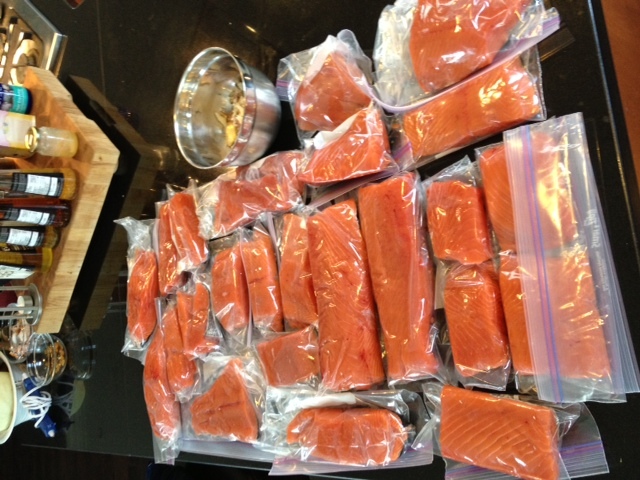 I learned how to gut/de-bone the salmon and then upon getting home, I got my catch ready to freeze. That is months of eating salmon every week…and to buy this in the store I would likely be spending close to $800-1000. Not bad for an afternoon out on the water…and afternoon of LEARNING. I Don’t Like to Be Given Fish OR GIVE People Fish in Business World.. Moral of the story, I don’t expect others to do the work for me. If there is an opportunity for me to learn something new, I take advantage of it. I could have sat there in the boat and watched my friend catch the fish all day for us, but what would be the fun in that. He would been “giving a man a fish” instead of teaching a man to fish. At Wealthy Affiliate, one thing that I have learned over the years is that if you show somebody how to do something, they will do it. If you tell them, they will do it. If you give it to them, they won’t do it and if they do, they won’t do it well. They will rely on YOU every time they go to attempt something. I would rather teach someone how to create a business so they can have a long term business for years and years to come. One that will allow them to be self-sufficient regardless of the situation and one that allows one to understand the true formula to success. Those that create success in the online business world are no different than those that are successful fisherman. They learn the fundamentals and they learn through trial and error what works and what doesn’t. They also take advantage of the opportunity to learn from others…not to just wait to be told to do something, but rather to reach out and ask questions that could help them further advance their understanding and their skills. My question that I want to leave you with today is this. I think the choice is obvious. This is a great post. I am just a beginner in the online world and a think I realised is how much I have to learn before I start to earn. With all the scams I’ve came across before I found WA, I thought it would be easy and quick to make money online, that’s what we are made to believe, I came to understand the hard way that is not like that at all. First you learn, then you work a lot, then you work even harder to help other, and just then you will have your deserved income. Something I’ve learned in this live is that you need to give to receive, and most of the online scams make you believe you can just receive without giving back (which never works!). Thank you for this great information Kyle. Will be coming back to learn more. It is interesting because when you reach the point where you can help others do something in an applied sort of way, that is truly when things have sunken in and you know the process. This will happen with every aspect of your business as you put forth the effort and you “do” not just “learn”. You could read all of the fishing books in the world, but until you get out there on the lake or the ocean, you are not going to be in a position to (a) be a great fisherman (b) teach others how to fish. I love this post, it makes you realise that whatever you have or want you have to work for it and you have to learn it, knowledge is something priceless, that’s why it’s the way I am trying to live my life by learning the more I can, and as creating a business it’s the same thing, nobody will do it for you, you have to work at it like any other thing and the reward of it will be the greatest! Exactly, nobody will do it for you if you are not willing to do it for yourself. It is a catch 22, but those willing to do the work are those that will always reap the rewards and at the end of the day, be in a true position to help others out. There is no greater reward than accomplishment. Nice post it makes you stop and think about how learning Internet marketing really is no different to anything else worth doing, you need to spend the time learning the craft. There’s no shortcuts to long-term success. So true Tim, now that you have found WA you definitely have a place where you can feel comfortable learning knowing that you are going to learn the PROPER process of building a business online, one that is geared towards building a long term and very successful business. If you can become self sufficient with your day to day task, no different than learning how to fish, you are going to have a very bright future ahead of you. This post reminds me of human’s behavior (and greed) towards free stuff that are available in this world. When it’s free, everyone wants it – whether they need it or not, that’s another matter. When it’s not free, you’ll take the time to think if you are willing to put in time/ money/ effort to obtain this desirable object. Using survival skills to get what you really want will make you look at the fish on your plate differently. I know first hand about this. You put something online for “FREE” (Craiglist or otherwise) and you literally have 100’s of people contacting you wanting it. People that absolutely do not need it. People by nature are willing to “take” before they think “create”, simply because it is the path of least resistance. Catching a fish can be hard work, but the gratification is far more than having someone give you fish…and it can live to a lifetime of eating. If people stop giving you fish in life, you stop eating….time to learn how to fish! I laughed so loud when I saw the picture of your big catch! Well, I thought you ended up not catching anything, lol! That reminds me We didn’t know each other that long, but day by day I have seen your persistence and altruism. Learning is good. But teaching others what you know is memorable! Thanks for this great story. Exactly, it would be easiest enough for me to help a small handful of people personally (and end up doing the work for them), but that would create some serious limitations to the number of people I could help and ultimately how sustainable they would be in their own respective business. It is my ongoing effort to continue to teach people how to “fish” so to speak in the online business world in the most efficient, effective, altruistic (as you said) and success driven way. I just moved from the great Northwest to Florida. While, I do not miss the cold and the rain of the northwest, this post reminded me how much I miss the salmon. This article really made me stop to do a little self-evaluation. I do love learning new things. In fact, I have discovered that when I stop learning that is when I stop having fun. At times, the learning process is hard and I feel like I am beating my head against a brick wall. Sometimes it even seems that I will never break through the wall. Nevertheless, in the end, when I do break through the wall and figure out the problem, I feel like I am on top of the world. My confidence grows and I am ready to tackle the next challenge. To apply this to my online business, I realize that I need to enjoy the process of learning and not be in such a hurry for the end result. Enjoy the process, discover what lessons or skills I need to learn, and take those lessons I have learned and use them to help mentor others. That is when I feel the most successful. Thanks for a great, thought provoking article. This is so awesome and exactly what I am talking about. It might be a little frustrating at first when you are learning something, but that is a NATURAL part of learning. Nobody became successful without having a fearless attitude about educating themselves. Knowledge and often times learning how to fail are powerful tools in personal growth and growth within business. Any brick wall can be knocked over with enough force and sometimes we all need to remind ourselves of this. It makes you realize how many people just want to eat nad not really learn how to catch it. I’ve tried really hard with some people trying to help the learn this mentality, but usually I’ve found it takes something within each and every one of us to actually want to learn “how to fish”. People love to eat and people love handouts. However, as a culture we do encourage this sort of behaviour somewhat as people do feel less and less capable as they get older of learning new things. This prevents people from doing a lot of things that in their younger and perhaps more naive years they would have done. Be fearless. Take action. Learn new things, even if it is how to fish. You will be able to reap the rewards of your newly found knowledge. Once again you pegged it. I have used this expression many times. However, sometimes we forget about the “after” of catching. Notice you also learned what to do with the fish you caught. This is just as important as learning how to fish. Living in Eastport Maine, I learned a little about salmon, and farm raising them as well as catching them. – If you catch the fish and don’t know how to prepare it, it may not be the best when you eat it. – I have prepared salmon for people who said they didn’t like salmon, but do when its prepared in a manner to their “taste”. – My wife likes it grilled when I use honey and lemon garlic, but not well done. I prefer medium well and lemon and black pepper with a honey glaze finish or hot apple smoked. – We both eat it anyway it is served, but the lessons of preparing what was caught make it better. We need to teach a man to fish, but we also need to teach them how to use what they caught. Well said Scott, I really love where you have headed with this. People most definitely need to learn how to perform the given tasks, but thinking outside of the box when they actually have completed that task and taking it to the next level is requisite for being that much more successful. Sure, we can catch a fish. Now we have become self sufficient. We eat, we live. But, that doesn’t mean the fish will be delicious when we eat it. Same goes with business, we can build a website, we can create content, but it doesn’t necessarily mean our audience is going to love it and worse yet, Google won’t live it. That is where the “spice” comes into play to flavour it up and make it appealing to the outside world. This is a great post on an interesting topic. I want to add my own example to this just for fun. I have some family who live in Phoenix and I visit them every year. I always drive down to see them and it’s such a big crazy city so I always used GPS to find their house. Then one year, my GPS wasn’t working and so when I arrived in Phoenix I got lost right away. This forced my to go buy a map, study it a little bit, then find my own way. Eventually i found my way after hours of being lost. The following year when I did my trip to Phoenix, I didn’t even turn on the GPS. i just drove straight to their house. So the point is, as soon as I was forced to do it myself without help, I learned how to do it. But when it was being done for me(by the GPS) I didn’t learn a thing. So your post reminded me of this story. It’s so important to know how to do things on your own especially in the online business world. Being self sufficient is the only path to success. Exact same story here. My stepfather does the same thing, he uses GPS so much when he travels that he never understands the roads or the direction he is going. Instead of learning it, imagining it, and seeing and “feeling” it through a map, you are never going to properly learn the roads to a successful journey. This is a very real analogy of how success with anything works. If you don’t do it yourself and you have someone else (or technology) doing it for you, you will never truly become successful at the given task yourself…regardless of what it is. You hit the nail on the head with the concept here. We all have to develop skills at some point. We have to learn the art of producing in whatever we are trying to do, catching salmon like you did here, or online marketing. Trial and error have to be accepted. Success will come as long as you don’t quit. Your attitude as you go is the key. Avoiding self pity is also key. You have to continue to find ways to work smarter instead of harder and try to make a valuable contribution, instead of always expecting others to give you something. I hope to contribute something each day, encouragement to others if nothing else. I agree Scott, when people fail they tend to feel sorry for themselves. It turns out to be a vicious cycle and people never end up learning as a result. Once you learn how to do something for yourself in an applied sort of way, you have a skill that nobody can take away from you. You become the craft and you can generate a good deal of income from your craft. I completely agree, I would rather become a master fisherman than to have someone hand be a plate of fish. Exactly Daniel, the sea has far too many fish for us to catch them all as well…billions and billions of fish being caught every day and you only need a very small portion of this to be very successful online. Absolutely salivating (!) about the salmon and your ability to write. In my journey toward learning how to be successful online, I’ve discovered I have a writers block. I attribute this block to my rebellious relationship with my high school English teacher. Small high school, same teacher for 4 seeming long years. All because of punctuation. I never got it. My punctuation pauses never matched his grading. (example: to many commas, not enough commas, should have used a semi-colon, wrong tense. On and on, ad nauseum, to me). I still want to fall asleep just thinking about that classroom experience. I still labor over writing anything! This small message took over 15 minutes. While I am learning to fish the internet, I anticipate plowing through my writers block! A goal that previous I never attempted to tackle. I have maybe over done it in this example…or not! Congratulations on your big catch of salmon! This was a great and easily understood metaphor. You have to try it to find out whether you like it or not. You’re absolutely right that it is important to learn it, so that it can be a long term business. Great article and you are completely right. Nowadays many people are complaining about their economic situation. If I tell them man you have to build assets and create passive income and I can teach you that. People look at me as if I’m crazy. They’d rather keep on doing the same things and expect different results. Yeah, teaching someone to fish is long term achievement as opposed to just giving that ends when given thing is used up. I couldn’t agree more, Kyle. I’d rather learn how to do something myself than have to depend on anyone else to do it for me. BTW, it looks like you did a great job at fishing! I’ve gone fishing before, and it’s not boring at all if you’re actually the one fishing and not just watching someone else fish. I totally agree with you. I am someone who love to learn and do things myself rather than have someone do it for me. Although, DIY has it own pros and cons, like taking longer time to get things done, especially if you are just starting out. But the fact that I will be able to do the task myself whenever I want to makes it worth the extra time. Over a year ago I got into online marketing. I started out with no knowledge whatsoever of making money online but I was determined to learn everything I needed to, to get my business going rather than paying someone on fiverr or somewhere else. Some people did not see it as a good decision, but I was bent on learning. I am already earning online via my websites and offline by training others to do same. Just last week I learnt inforgraphics designing all by myself and already, I am getting people who wants me to design for them. “No knowledge is ever wasted”, it either help you to keep your money in your pocket or bring more into it. I am sure I will get to a point where I will outsource some part of my business, but for now, I am still Doing It Myself. The thing about learning it for yourself Railu is that when you understand something, you can delegate it as a task to others. If you understand the type of content your website needs, you can get help from others to build your content. This goes for every aspect. To start off by trying to get others to do the work for you is next to impossible because you don’t know what you want. That is why I always suggest to product owners that first, you learn how to promote your own product. If you understand how to promote your own product/service, then at that point you can help other affiliates promote your product or service. Not before. Thanks for a cool post, Kyle. Learning something new is always fun, at least for me. … Do you need my special Salmon Tartar recipe? As they said in the Hitchhiker’s Guide to the Galaxy “So long, and thanks for the fish”. In reality you need to put what you learn into practice, including making mistakes along the way. Good message here. Thanks. Absolutely Mike, mistakes are where the learning takes place. Nobody learns to run before they learn to crawl…and without a ton of bumps and bruises along the way. Same with the online world, nobody creates success without overcoming hurdles and it is because of those very same learning experiences that they are able to create sustainable businesses online. I can relate to the analogy of fishing when it comes to online business. for example when i was cray fishing ( Southern Rock Lobster ) for a living i had to learn the basic fundamentals of the game such as what bait to use and how to bait the pots the right way, as well as learning the areas they were expected to be and the type of bottom they lived on, the seaweed they like to hang out in etc. A lot like online marketing with a product you learn to find the right keywords so you know what your prospects are looking for, then set the baited pot (Article) and if that article is attractive enough and delivers what the prospect is looking for there is a good chance of getting a good client. And it all comes back to learning from somebody that knows how to fish in the first place so you get the skills to feed your self for life. Exactly Chris…here is how I would compare fishing to the online business world. eating the fish = reaping the rewards of your hard work and dedication. Well said Kyle … Learning and growing to be self sufficient is the way to go! I enjoyed this article ,it remind me the simple away to get the great and right attitude for the business. Thank you for share . Hey Kyle glad to hear you got the fishing bug and WOW a 26lber awesome. To me there is nothing more enjoyable than spending a day on the water with some mates catching fish. Now you have tasted it you will have to try your hand at fly fishing for them. Spinning a lure or down rigging is fairly easy compared. Try casting a fly to a Salmon and watch as it takes it. To me bliss! Wealthy Affiliate has shown me so much over the past year and as I go forward I’m more capable and can work faster. I am also now in the position to teach others and do regularly when I see a question posed I can answer which in WA is so FREELY given by others also. One day I will definitely have to learn how to fly fish Mark [adding to my bucket list]. It is definitely amazing when you not only see it happen, but moreso when you get to experience it as a result of your own doing. It is much more gratifying and that education leads to much more longevity and fruits of the labour. Glad you have learned so much within Wealthy Affiliate and I look forward to an exciting 2014 ahead for all of us. There are lots of fish out there and there are going to be a lot of expert fisherman (and women) as they year goes on! PS. Your website is looking great, how appropriate this post is!